A disturbing report released Tuesday on America's readiness to respond to disease outbreaks, natural disasters or acts of bioterrorism says federal budget cuts affecting all levels of government have put the nation at risk. Preparedness was on an upward trajectory after the Sept. 11 and anthrax attacks, but the nation's economic crisis is "eroding a decade's worth of progress," according to the ninth annual report from the Trust for America's Health and the Robert Wood Johnson Foundation. "We feel it is important to conduct this report each year because we believe that the public deserves to know how prepared their states and communities are to respond to public health emergencies," said Jeff Levi, executive director of the Trust for America's Health, who spoke with reporters during a teleconference from Washington. "Sadly, the track we're on now with the budget cuts may mean history could tragically repeat itself when the next tragedy strikes, we won't be ready." Wisconsin is one of 10 states at risk of losing federal funding for its "Level 1" chemical testing capabilities, which would be needed in the event of a chemical terrorist attack. Milwaukee already has lost key federal funding for regional public health emergency preparedness. Milwaukee also is at risk of being cut from a U.S. program that supports efforts to rapidly distribute and administer vaccines and medications in an emergency, whether it's a pandemic flu outbreak or a less likely, but far more dangerous, bioterrorism attack, the report says. Loss of funding could mean loss of jobs and expertise in key areas of emergency preparedness in Wisconsin. Of the 300 people who work in the state Laboratory of Hygiene, nine with chemical testing expertise are partially supported with federal money that's at risk. Of the six Milwaukee Health Department employees who work in emergency preparedness, five are funded by federal money. Since the Sept. 11 terrorist attacks, which revealed significant deficiencies in the country's disaster preparedness, the U.S. Centers for Disease Control and Prevention has sent more than $7 billion to states and cities to help them improve preparedness for everything from disease outbreaks to bioterrorism to natural disasters such as hurricanes, tornadoes and floods, the report notes. However, federal funds for those efforts declined 38% from fiscal 2005 to 2012 (adjusted for inflation) and additional cuts are expected under automatic spending cutbacks that would take place if Congress cannot agree on ways to cut the total budget, the report says. Wisconsin's federal preparedness funding dropped from $20.3 million in fiscal 2010 to $17.6 million in 2011. This funding has been decreasing steadily over the past five or six years, said Beth Kaplan, a spokeswoman for the state Department of Health Services. Cuts were not unexpected, she said, and the state planned for them. "We are more prepared than we have been in the past. We have been lean and efficient since these programs started, as we expected funding to decrease," Kaplan said. The report is on target, said Paul Biedrzycki, director of disease control and environmental health for the Milwaukee Health Department. "We monkey with this funding at our own risk," Biedrzycki said. "Public health funding is typically discretionary, and discretionary spending is often subject to political maneuvers." Decreasing funding will decrease preparedness and increase the impact of a "high-consequence event" such as a chemical attack that would be intended to kill as many people possible, as quickly as possible, Biedrzycki said. "Our regional capabilities and capacities have been crippled. Our surveillance network regionally has been compromised. We're back to more of a silo approach for emergency preparedness and response because our regional model has been dissolved." A regional model that Milwaukee lost in August was set up to coordinate a five-county response to an outbreak of an infectious disease, whether it occurred naturally or was the result of bioterrorism. "These diseases do not stay in one place for long," Biedrzycki said. "We have to share information, lab resources and distribute scarce medical countermeasures." The state's chemical testing lab quickly could determine whether an attack involved mustard agents, nerve agents or other toxic industrial chemicals agents other countries have developed for military purposes. "We need to be able to quickly analyze and identify these chemicals," Biedrzycki said. Loss of chemical testing capabilities in Wisconsin and nine other states, if proposed funding cuts are enacted, would leave the CDC as the country's only remaining public health lab with that capability, the report says. Local preparedness for a public health emergency depends on "stable and sustainable funding and priority to be fully functional, efficient and successful," Biedrzycki said. "Preparing for naturally occurring outbreaks enhances our preparedness for intentional outbreaks," he said. 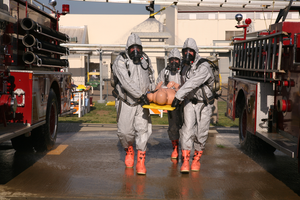 "If the real threat of bioterrorism occurs, we'll be better prepared. The intentional events are nefarious and pose the greatest challenge to public health preparedness." When the novel bird flu appeared in Hong Kong in 2003, Biedrzycki said, "we started preparing for a pandemic. After it was gone, the money disappeared. There's no guarantee there won't be another pandemic." * A 20% decrease in a CDC Bioterrorism Cooperative Grant used for preparedness staffing, regional consortium planning, and related supplies and contracts. * A 15% decrease in funding from the CDC Cities Readiness Initiative used for preparedness staffing, planning, and related supplies and contracts. * And a loss of all funding from the Department of Homeland Security's Urban Area Security Initiative used for staffing, laboratory and disease surveillance enhancements. Federal money typically flows from the CDC to the state before being allocated by a funding formula to county and city health agencies. The CDC's Bioterrorism Cooperative Grant has been the primary funding source for preparedness to state and local health departments since 2002. It supports distribution of mass prophylaxis/antibiotics to metropolitan areas within a 48-hour window, based on an aerosolized anthrax scenario that would kill 98% of the exposed population within 96 hours, Biedrzycki said. "Americans expect the public health system to have the capability to competently protect their health during emergencies," said Mel Kohn, state health officer in Oregon, who participated in Tuesday's teleconference. "We will be unable to absorb reductions of this magnitude simply by finding efficiencies. We have reached the point where our ability to do this work will be seriously compromised, with life and death consequences." The report was funded by the Robert Wood Johnson Foundation, the nation's largest philanthropy devoted exclusively to improving the health and health care of Americans.